I agree. It makes your Violin all messy. If you do, the local police will shanghai you for the chain-gang. Or for organ donations. That way you will live on, just in separate geographic locations. Do it on the chorus. Well, up your nose, then. – ….and now for something completely different – a man with a bridge up his nose. Liar. That sign IS on the bridge. The original sign was too long. This sign is an a-bridge-ment of the original. Because it’s TOO FAR, Field Marshal Montgomery! @Running Comment | 6:06 am: Different? But every human nose has a bridge. @DnT 0113 . But he could be a Civil Engineer, with all his knows in a bridge. The true meaning of the Chinese text is just as puzzling. 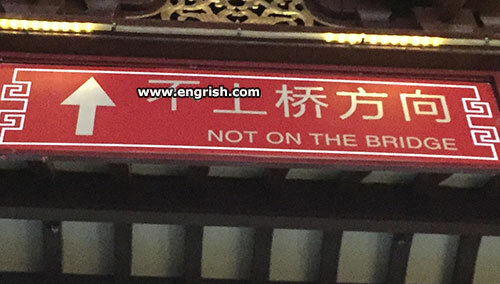 It says: “this is not the direction to go up the bridge”. I guess it’s a way to keep the sign-makers busy after all useful signs are done. Maybe this garden uses inverse logic. To find your way, find the road that does not have a sign saying it’s the wrong way. Shall we do it in the troubled water?